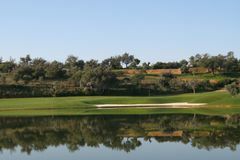 It would be a lie to say that Silves is anything but a challenging course, but that doesn't mean players of various abilities can't enjoy this picturesque and imaginative layout. We found 27 offers matching your search. Silves is the type of course that you can probably only fully appreciate if you're a reasonably accomplished player. That's not to say a beginners can't enjoy a round here. The first-class conditioning, wonderful scenery and panoramic vistas from the high points of this undulating course add a real sense of occasion that players of any ability can appreciate. However, this is a strategic course through and through, and the mind games start from the off. An aggressive, high quality tee shot that skirts the water encroaching from both sides will leave you with a short, straightforward approach shot to a generous green. The alternative is to play more conservatively from the tee but leave yourself a long uphill shot in that will much harder to judge from back down the fairway. It sets the tone for a course that is set-up to present risks and rewards in equal measure. The bunkering, in particular, is situated to catch out big hitters, but longer players do not enjoy a massive advantage here. While there are six high quality par-3 holes ranging between 150-220 yards, it is the four par-5s that are, arguably, the most memorable holes. The 13th sums up what this course is all about. A par 5 with an elevated tee, it offers up some stunning views. A tricky second shot leaves the player with the dilemma of going for the green in two or negotiating a dogleg left protected by a large water hazard. It might be hard to concentrate on such course management issues when the vast majority of holes offer spectacular mountain and valley views overlooking palm trees and olive groves. But if you want to make a score at Silves you'll need to keep your wits about you at all times! Great fun. Course was in fantastic condition. what a course to welcome our first day in Portugal. the course was in great condition and some of the holes where breath taking. it was a tough walking course for the first day.